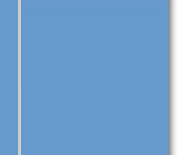 "We Buy & Sell Used Mailing Equipment "
Spot Color – in Many different colors - $21.95 ea. Aqueous Black Ink – For Aqueous Coated - $24.00 ea. “Now the NEW Super Fast Dry for problem coatings” – $24.95. ea.. Call today for the Best Ink and Prices Around! Pro Mailing Equipment Has an extensive inventory of parts at GREAT SAVINGS! We now accept Visa, Master Card, and American Express!!!! "CHECK OUT OUR UPDATED RECONDITIONED PAGE, PRINTERS,AND MORE"! Call Pro Mailing Equipment for Liquidation of Mailing Equipment Services Today! Pro Mailing Equipment, Inc. is a supplier of new and rebuilt phase II, phase III, Bell and Howell, Pitney Bowes, Phillipsburg, Cheshire, and Inserco mailing supplies, mailing machines, and other quality mailing equipment including tabbers. If you are seeking total solution mailing equipment, you have come to the right place. We sell and lease brand name, new and rebuilt mailing equipment. Our professional staff has extensive sales and service background for all major brands of mailing systems and can help you in making selections for your mailroom or answering your questions about our mailing machines. We also buy used mailing equipment. We build and design total intelligent inserting systems using new GBR 420 and GBR 438 Smart Feeder/Folder Systems with many options such as: OMR, 3 of 9 Reading, and others. Our system is not software or PLC driven. We use the most reliable system configuration available. We also offer training for your maintenance staff at our facility on any inserting machine systems you purchase from us. This training is free of charge to our customers (excludes travel & lodging costs). 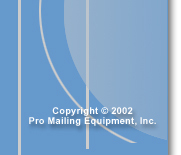 Pro Mailing Equipment, Inc. is your total solution company. It is our goal to save your company from expensive down time and costly service calls. Call our sales team today for more information.